2 although in fact it was not Jesus who baptized, but his disciples. 3 So he left Judea and went back once more to Galilee. 4 Now he had to go through Samaria. of ground Jacob had given to his son Joseph. sat down by the well. It was about noon. "Will you give me a drink?" 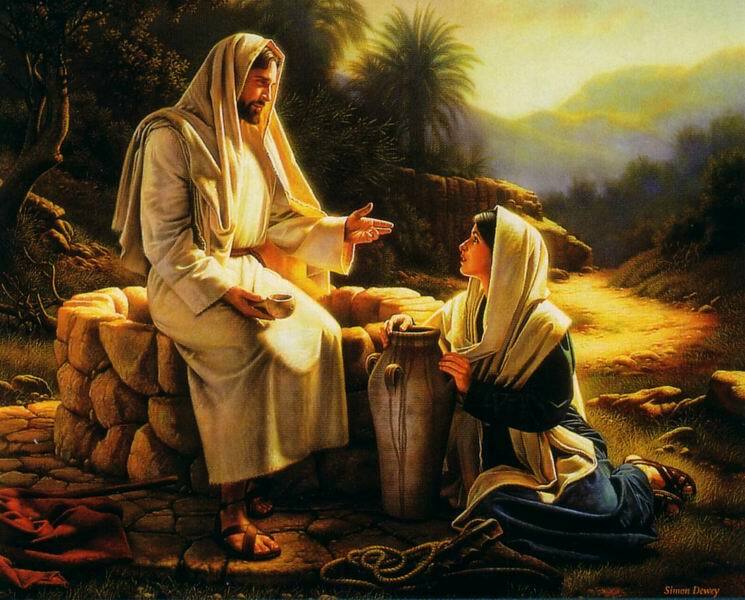 9 The Samaritan woman said to him, "You are a Jew and I am a Samaritan woman. How can you ask me for a drink?" (For Jews do not associate with Samaritans. for a drink, you would have asked him and he would have given you living water." 11 "Sir," the woman said, "you have nothing to draw with and the well is deep. Where can you get this living water? it himself, as did also his sons and his livestock?" I give them will become in them a spring of water welling up to eternal life." and have to keep coming here to draw water." 16 He told her, "Go, call your husband and come back." 17 "I have no husband," she replied. Jesus said to her, "You are right when you say you have no husband. your husband. What you have just said is quite true." 19 "Sir," the woman said, "I can see that you are a prophet. where we must worship is in Jerusalem." the Father neither on this mountain nor in Jerusalem. for salvation is from the Jews. for they are the kind of worshipers the Father seeks. 24 God is spirit, and his worshipers must worship in the Spirit and in truth." hen he comes, he will explain everything to us." 26 Then Jesus declared, "I, the one speaking to you-I am he." with a woman. But no one asked, "What do you want?" or "Why are you talking with her?" 29 "Come, see a man who told me everything I ever did. Could this be the Messiah?" 30 They came out of the town and made their way toward him. 31 Meanwhile his disciples urged him, "Rabbi, eat something." 32 But he said to them, "I have food to eat that you know nothing about." 33 Then his disciples said to each other, "Could someone have brought him food?" 34 "My food," said Jesus, "is to do the will of him who sent me and to finish his work. so that the sower and the reaper may be glad together. 37 Thus the saying ‘One sows and another reaps' is true. of the woman's testimony, "He told me everything I ever did." and he stayed two days. 41 And because of his words many more became believers. and we know that this man really is the Savior of the world." 43 After the two days he left for Galilee. 45 When he arrived in Galilee, the Galileans welcomed him. They had seen all that he had done in Jerusalem at the Passover Festival, for they also had been there. 46 Once more he visited Cana in Galilee, where he had turned the water into wine. And there was a certain royal official whose son lay sick at Capernaum. 47 When this man heard that Jesus had arrived in Galilee from Judea, he went to him and begged him to come and heal his son, who was close to death. 48 "Unless you people see signs and wonders," Jesus told him, "you will never believe." 49 The royal official said, "Sir, come down before my child dies." 50 "Go," Jesus replied, "your son will live." The man took Jesus at his word and departed. that his boy was living. at one in the afternoon, the fever left him." "Your son will live." So he and his whole household believed. 54 This was the second sign Jesus performed after coming from Judea to Galilee. a heavenly star in miracle of rebirth!